You can view our most recent newsletter by clicking here! Silicon Valley technology is transforming the way we work, and Uber is leading the charge. An American startup that promised to deliver entrepreneurship for the masses through its technology, Uber instead built a new template for employment using algorithms and Internet platforms. Upending our understanding of work in the digital age, Uberland paints a future where any of us might be managed by a faceless boss. The neutral language of technology masks the powerful influence algorithms have across the New Economy. Uberland chronicles the stories of drivers in more than twenty-five cities in the United States and Canada over four years, shedding light on their working conditions and providing a window into how they feel behind the wheel. The book also explores Uber’s outsized influence around the world: the billion-dollar company is now influencing everything from debates about sexual harassment and transportation regulations to racial equality campaigns and labor rights initiatives. 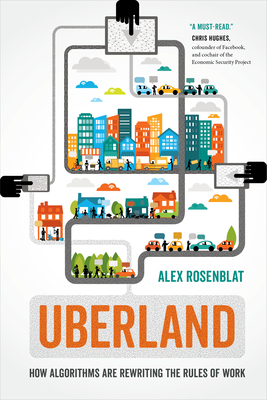 Based on award-winning technology ethnographer Alex Rosenblat’s firsthand experience of riding over 5,000 miles with Uber drivers, daily visits to online forums, and face-to-face discussions with senior Uber employees, Uberland goes beyond the headlines to reveal the complicated politics of popular technologies that are manipulating both workers and consumers. Alex Rosenblat is a technology ethnographer. A researcher at the Data & Society Research Institute, she holds an MA in sociology from Queen’s University and a BA in history from McGill University. Rosenblat’s writing has appeared in media outlets such as the New York Times, Harvard Business Review, the Atlantic, Slate, and Fast Company. Her research has received attention worldwide and has been covered in the New York Times, the Wall Street Journal, MIT Technology Review, WIRED, New Scientist, and the Guardian. Many scholarly and professional publications have also published her prizewinning work, including the International Journal of Communication and the Columbia Law Review. “A fine work of technology ethnography. . . As someone who believes that technology is a positive force for driving change, I’ll admit to being deeply disturbed by reading Uberland."